I am curiours to what everybodys favorite welding project is. post a couple pictures and its story. My favorite welding project was when I was commisioned to make a 6'x6' sign for a company called pakit liqudators. Pakit liqudators is a resell place for old building materials and everything eylse. Its a packrat's paridise. Each leter has a different theme. It took about 25+ hrs to do. It looks better when you are standing in front of it. trying to get a company in town here to auto cad it so i can laser cut them and produce them. Building one of my own for a 2005 xterra. I made this last year and two more this year. Its the Majerle Hustle award given to Phoenix Suns players for what Im guessing is showing some hustle on the court. Here it is finished behing given away by Majerle. Very cool. Congrats on the commission! Signs! bumpers! and awards oh my! Cool projects guys I'm with metalmaster I like any project. How cool would that be to see something you built on t.v. Keep them coming. Arc, that is a very cool bumper. I've built a few and have plans for a few more. I like the complexity of yours. 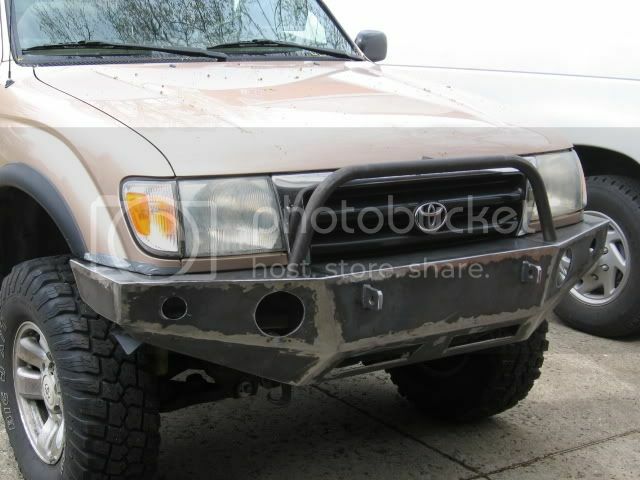 I built this one for a Toyota Tacoma based on the customer's wishes. I like them all but the one that got the most notice was the Crazy Cart I built awhile back for my DX200. It was a "fun" project with no limitations. I just completed a custom trailer for my Trailblazer 302 that I enjoyed as well. Heck there all fun! This welding table I just finished is my favorite project so far. It adjusts to different heights using a hydraulic floor jack. It's my favorite because now when I do new projects, I won't have to work on the floor of on sawhorses! It takes less time and money to do it right than it does to do it over! thats a neat table u have there, mine is just a piece of 4x8-1/2 steel and i can barely move it need be. Last edited by JimYoung; 05-11-2008, 07:01 AM.